When I was a boy, I remember making walnut boats like this with my Grandma. My sisters and I would play with them in the bathtub. They were so simple and fun. 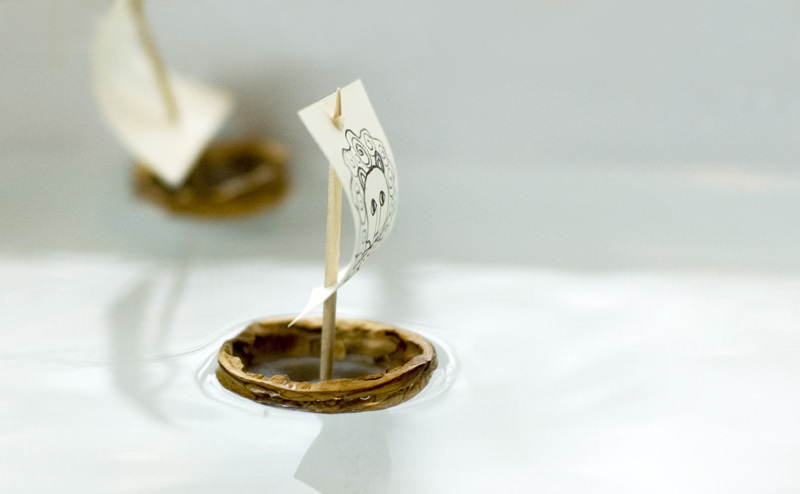 This morning we had some walnuts in the kitchen, so I made some boats with the kids! 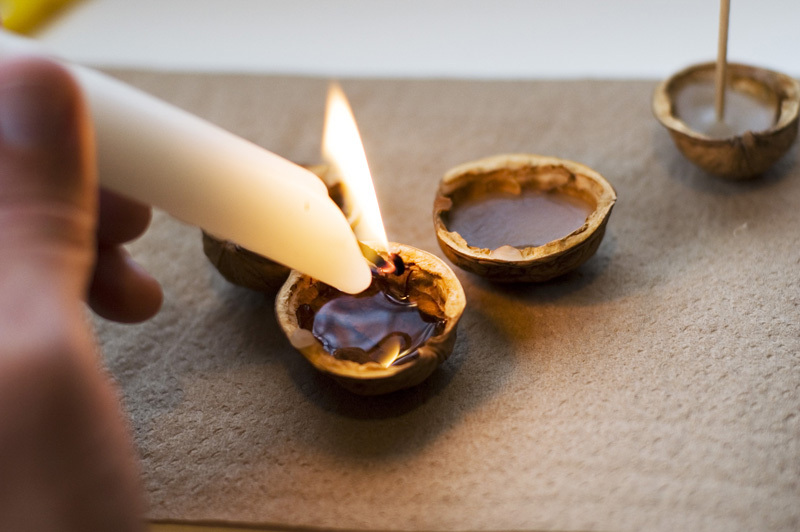 Just melt some candle wax into a walnut shell. When the wax gets a little firm, stick a toothpick in it for the mast of the boat. Let the wax cool. (We stuck ours in the fridge for a couple minutes.) Then attach a paper sail by poking it onto the toothpick. Ahoy! 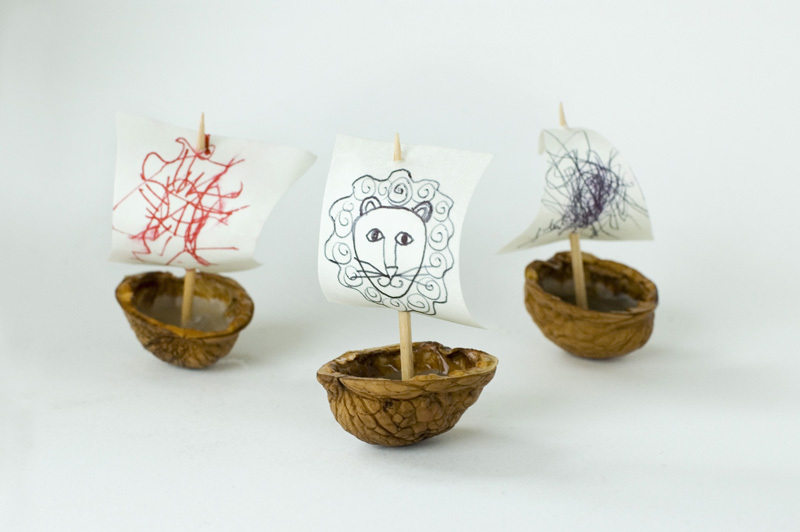 Last winter we've made candles with walnut shell but I've never thought about making a boat of it. Really a simple and fantastic idea! Thanks for sharing. OOOh thanx, we tried this with playdo but it didn't work well! we've been making walnut boats and paying in the puddles, so much fun! love your sails! Oh we have always tried to make these and never knew how to keep those pesky masts up... I love the wax, its a brilliant idea!!! Thanks again for another great idea!!! Good idea. I will try this with the daughter of my neighbors at the weekend. lovely idea! i will try it for sure with my son, thanks! Thanks everybody! Yeah, this craft really takes me back. I love it. Your ideas totally inspire me. Especially for a simpler, but easily just as enrichening, childhood for my three boys. I cannot wait for your craft/toy book to come out. And please keep up the wonderful photography. Simply charming. I made something like this as a child with milkweed pods--it was in first grade and we made one to represent Columbus' ship. Cool. Super idea. ThatÂ´s something I should try to make with my boys. I've just discovered your site. It's brilliant ! thanks for all these little creations. Neslihan - Nope, sorry I don't have a twitter account. Maybe someday. What's the best way to crack the walnuts so you end up with two nice halves like that? I cracked these nuts by gently pounding them over the seam with a wooden muddler I had in the kitchen. When the seam started to come apart then I pried it open the rest of the way. Those walnut boats are so great, I had to post them too! Thanks for the tutorial! Thanks everybody. Your boats are fantastic! Mammagiramondo - What a great experience you made! Nice! Your blog is amazing - a complete inspiration - and I was delighted to read that you are already working on a book - do you have a release date for it? 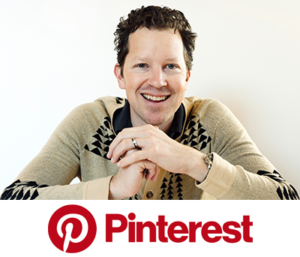 Tienes unas ideas estupendas, Gracias. How do you get the walnut shell to separate so perfectly? This looks very fun. Would love to make some for our little one to take to the creek. Thank you. 60 идей летних развлечений | БФ "Цветы Жизни"